People love villains. A really good baddie that people love to hate can turn a story into something great. I mean, it can be pretty hard to root for your hero if they don’t have much interesting to go up against. One of the most classic and well-loved group of baddies has to be The Misfits from Jem and the Holograms. A sassy, bad-to-the-bone band of ladies who love to make life hell for the Jerrica Benton’s band (and their record label… and even sometimes their fans). What Kelly Thompson has done with the original Jem and the Holograms comic series for IDW is really flesh out contemporary personalities for each of its characters. While it’s been fun to watch The Holograms grow, the other part of the fun has been watching The Misfits get into lots of trouble and totally implode. Which is why Jem: The Misfits works so much as a series. The Misfits are so good at being evil, it’s kind of fun to watch them suffer because of all their nasty deeds (and makes rooting for them even better). The first issue of the new series opens up with the Misfits on holiday after being dropped by their label 5×5. While at Pizzazz’s beach house, Eric Raymond delivers the news to her that literally no label is willing to take on the Misfits due to their reputation for creating trouble. Though he does tell them that they have one option (or two – kind of): either make a Misfits reality show or be booked as entertainment on a cruise. Pizzazz is immediately not on board with the reality show idea, “We’re musicians. We’re not some talented hacks that just want 15 minutes of fame.” Her defiance is also a look into her younger years which is totally illuminating. Readers even get a Misfits origin story, both of which we never got much of in the original cartoon. And while sure, the Misfits are technically the baddies, you can’t help but root for them a bit. Pizzazz “lost” her original family, made she managed to make a new one with the girls she chose herself. And really, there’s a lot that hits homes about the sentiment. It’s because of Pizzazz’s fierce dedication to her band that she ultimately decides that the Misfits need to do the reality show, especially when the only other option would be to disband. Sometimes sticking together is a bit more important than your dignity (or something). Jem: The Misfits manages to be silly, delightful and sweet as Thompson continues to dominate with her writing for the franchise. She’s done just a fabulous job with the main title, it’s great to see her work her magic with the Misfits as well. When Pizzazz tells her band that they’re doing a reality show (note: not asking) – their reactions are totally priceless. Jenn St-Onge is perfection at bringing each of the girls to life. It really is fun watching the band rise and fall and rise again – even if they are supposed to be the villains. 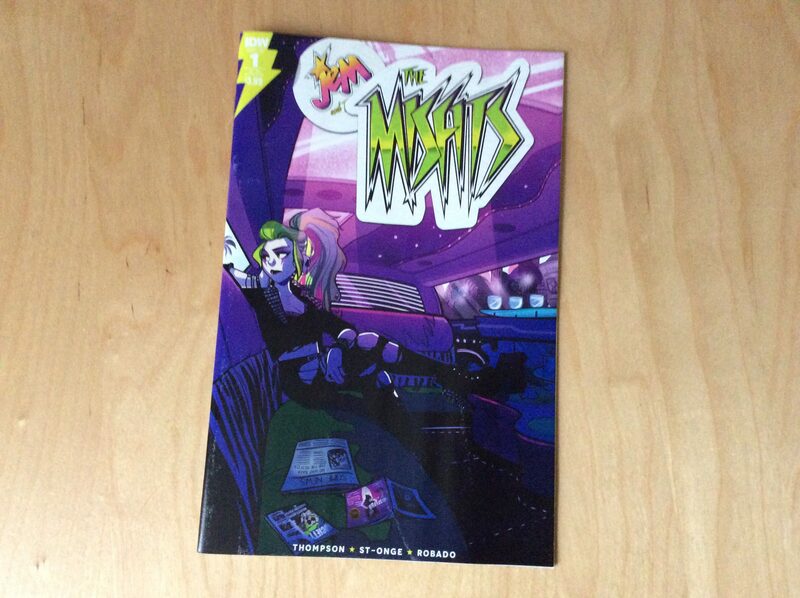 Issue two of Jem: Misfits will be in shops on the 1st of February.